Sustainability oriented innovation continues to garner increasing attention as the answer to how firms may improve environmental and/or social performance while simultaneously finding competitive advantage. Radically innovating new products and services to replace harmful market incumbents is central to this thesis, yet studies to date have found it to be a highly expensive process with high degrees of uncertainty and risk. Extant research however has largely neglected to examine the details of the actual product innovation process itself and has under appreciated the influence of corporate strategic context. Our paper addresses this gap in the literature through an in-depth case study of a sustainability oriented innovation process for a radical new product within a multinational life sciences company, DSM. 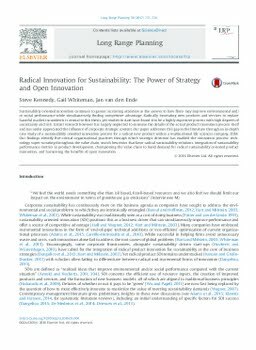 Our findings identify five critical organizational practices through which strategic direction has enabled the innovation process: technology super-scouting throughout the value chain, search heuristics that favor radical sustainability solutions, integration of sustainability performance metrics in product development, championing the value chain to build demand for radical sustainability oriented product innovation, and harnessing the benefits of open innovation.